With the conclusion of the QMJHL regular season, it was not until Saturday night following the final games that the matchups were confirmed. With a tight race, and many teams a point or two apart, it was anyone’s guess as to how the matchups would align. With the Wildcats winning their final game of the season the same way they started, against the Saint John Sea Dogs in front of a packed house at the Avenir Centre – the Cats would end the regular season with 85 points, to put them 7th overall in the East. The top two places in the division was a battle between the Halifax Mooseheads and Baie-Comeau Drakkar, but following that final game on Saturday, the Mooseheads managed to clench first to give us the Drakkar in round one. With the distance to Baie-Comeau more than 600km to travel, this series will be played in a 2-3-2 format. The Wildcats will start on the road with games on Friday night at 8:30 p.m. (AST) and Saturday at 5:00 p.m. (AST). Our two home games will be on Tuesday and Wednesday night, both starting at 7:00 p.m. 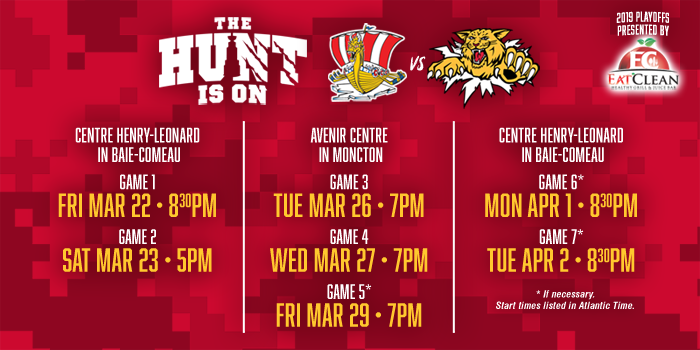 If necessary game five will be in Moncton on Friday night at 7:00 p.m. and the final two games would be played in Baie-Comeau on Monday April 1st and Tuesday April 2nd, both 8:30 p.m. (AST) starts.